While animals may kill each other for food, humans are the only creatures to do so out of cruelty, Nobel laureate Aaron Ciechanover told an assembly of Cambodians earlier this month. Ciechanover, who won the Noble Prize for chemistry in 2004, reminded 400 participants at the Institute of Technology of Cambodia that greed could drive human cruelty, something not found in other parts of the natural world. Ciechanover was speaking as part of an Asean “Bridges” program organized by the International Peace Foundation, which is based in Vienna, Austria. Ciechanover’s Nobel Prize came from the discovery of ubiquitin-mediated protein degradation, a mechanism by which the cells of most living organisms cull unwanted proteins. 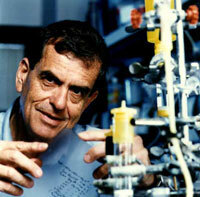 He shared the prize with Avram Hershko and Irwin Rose and is seeking the cure for cancer. Kem Oeun, deputy director-general for the Ministry of Education, who participated in the discussion, said the talk was a reminder that people must unite to build peace, but they must first know themselves. Ciechanover is a distinguished research professor at the Technion-Israel Institute of Technology, in Haifa, where he was born. He received his doctorate in medicine in 1981 from the institute. Om Romny, directory of the Institute of Technology of Cambodia, told VOA Khmer the institute was honored to have the laureate, whose talk was a rare opportunity for professors, scientists, students and other participants. Someth Paradis, a professor at the Institute of Technology of Cambodia, told VOA Khmer that the lecture was useful for students, professors, and researchers who participated. Phat Chan Vorleak, a senior studying food chemistry at the Institute of Technology of Cambodia, said Ciechanover was a role model for her.